Being a ‘weel ken’t face’ around the historical sites of Old Town, through twenty six years of tale-telling and interpretation on the Stirling GhostWalk and elsewhere, means that I’m often referred to as ‘The History Guy’. That honorific appellation prompted Destination Stirling to ask me to compose ‘The Stirling Sentinel’ features for their website, The History Press to request me to write on matters of local history, and regularly finds me invited to all manner of curious cultural get-togethers where a tale or two relating to the curious characters and incident’s of the Royal Burgh’s history are required. This weekend – Friday 27th and Saturday 28th March 2015 – provided Your Friendly Neighbourhood Hangman with a rather different opportunity. 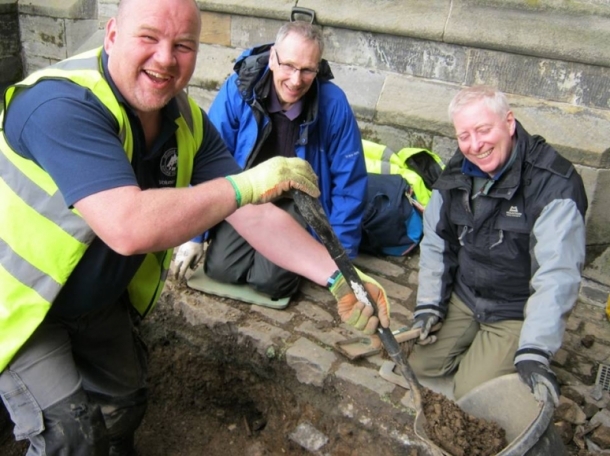 Observing the work of Guard Archaeology as they, on the invitation of the Friends of the Church of the Holy Rude, performed a minor excavation around the Church Wynd entrance of the 16th-century kirk. 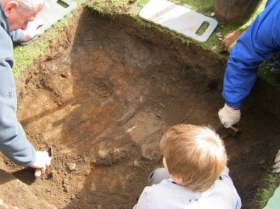 The aim of the operation was two-fold: to possibly locate buried remnants of the 1129 Dominican chapel which preceded the current building, largely destroyed by fire in the 15th-century, and to engage enthusiasts and local schoolchildren in the fascinating process of rediscovering the past. Two small sections of turf, roughly five feet square, were removed, and participants schooled in the art of delicately digging and brushing away the earth – and, most importantly, reminded that anything discovered would be carefully reburied before the day was out. Inevitably, the site having been in constant use as a place of worship and burial for at least 800 years – possibly much longer, as Burgh Archaeologist Murray Cook rightly noted on the day, there may well have been earlier places of worship on this site before King David II chartered the construction of the mediaeval kirk – the two small pits revealed what those unfamiliar with such excavations might consider a peculiar mix of objects ancient and modern. A handful of coins; a modern Penny discovered next to its 18th-century predecessor; shattered pottery, 17th-century blown glass and rusted modern bottle-tops side by side; a length of 1970s plastic water pipe, just a few inches above what may be a rectangular sandstone ‘Throughstane’, covering a Mediaeval tomb. Quite rightly this was not disturbed further. Enough to know that it is there! 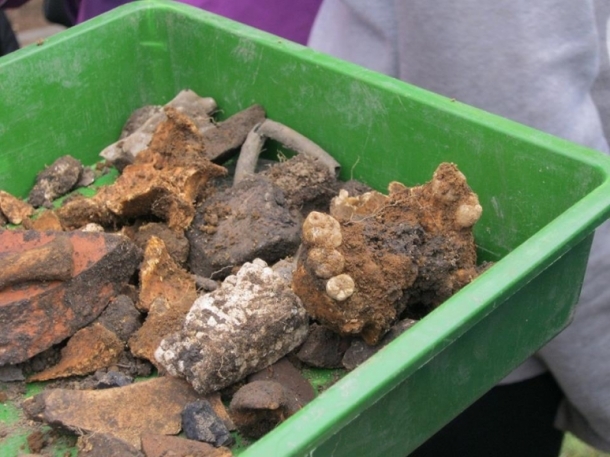 The upper bricks of an early wall were also discovered, a little more than a foot and a half from the surface. 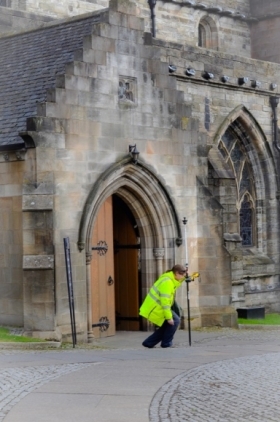 Ground Penetrating Radar was used both inside and outside the church, and – in a few weeks, when their scans are collated and processed – we may discover if this was or was not likely to be part of the 1129 church we sought. More information on these findings will be posted here as it becomes available. It is worth noting that these did not come from specific graves. These were ‘charnel’ – the fragmented remains of many centuries of burial, reburial, and the constant turning of earth as walls were built and removed, pipes laid and paths widened. Most burials in the lands surrounding the Holy Rude until the late 16th-century were un-coffined poor people. Space being at a premium, early remains were often moved aside to make room for new burials, and remains quickly deteriorated, broke up and were dispersed within the earth. Visitors to old graveyards, like the Holy Rude’s, which possess an abundance of wildlife, will often discover that moles and rabbits have inadvertently brought tiny fragments of bone to the surface. 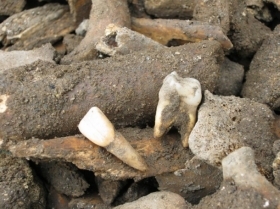 At our dig we discovered ribs, finger bones, a thigh-bone, sections of skull, a sturdy big-toe and a multitude of teeth with roots and strong white enamel, conspicuously lacking in cavities: our ancestors may have lacked dental care, but they were also spared the abundance of processed sugars which cause so many problems for modern teeth. From their location and deterioration most of these fragments are likely to have dated from anything from 300 to 600 years ago. Perhaps older. One small section of bone remains in my memory. A section of the Maxilla – the front upper teeth of the skull – of a little girl, of probably seven or eight years of age. Three-hundred years old, five-hundred perhaps...a reminder, whatever their vintage, of our own mortality, and of how few poor children survived to adulthood in those not-so long gone days. 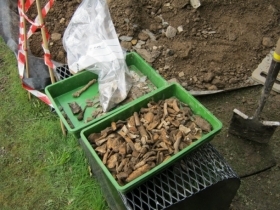 As noted earlier, Guard Archaeology and all those in attendance, were careful to restore this fragment and all other artefacts to the ground by the day’s end, when the turf was replaced. No keepsakes. No items retained for further study. Due respect was observed. Mind you, the sight of people digging up the earth clearly alarmed someone, as part-way through the Saturday morning dig two Police cars arrived, officers having been alerted to ‘grave-robbing’ in process! Those of you familiar with Stirling’s own infamous incidence of grave-robbing , in 1823 – that of the unfortunate Mary Witherspoon, whose body was disinterred and sold to a local medical student by the Holy Rude’s own gravedigger, James McNab – will be aware that participants in that despicable trade rarely, if ever, set to work in fluorescent High-Vis jackets and with an audience of thirty...including the Minister and Elders of the kirk! We had hoped to use the GPR to seek-out the foundations of the Watchtower raised in the graveyard to (successfully) deter further desecrations by the 19th-century Resurrection Men...but ran out of time. 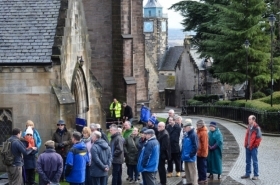 For more information on the Holy Rude and its graveyards, seek out ‘The Graveyards’ in our ‘Fact & Fiction’ section http://www.stirlingghostwalk.com/characters-from-stirling-history/the-graveyards or the features ‘A Matter Of Faith’ http://www.destinationstirling.com/see-do/stirling-sentinel-2/matter-faith/ and ‘Grave News’ http://www.destinationstirling.com/see-do/stirling-sentinel-2/grave-news/ on the Destination Stirling website.